If your phone was purchased from VoIPstudio, it has been already pre configured and there is no need to provision it. Please refer to Phone edit section to assign extensions. If your phone was not purchased from VoIPstudio, please perform a Factory Reset described in Factory Reset section above and Firmware upgrade. You can obtain your phone IP by following the steps described in Find phone IP section above. This is the provisioning link and AES Key. Name Phone any Alphanumeric Characters accepted. Click Upgrade tab at the top of the page. Click Advanced link at the top. Enter http://p.ssl7.net as Configuration Server Path. Enter AES Key into Common AES Key and MAC-Oriented AES Key fields. 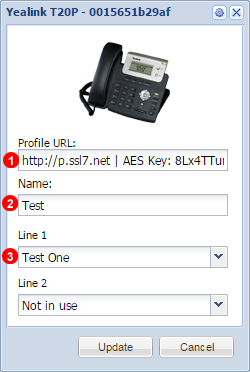 After a short while your Yealink phone will reboot and obtain configuration data from VoIPstudio provisioning service.